Some couples opt to not serve alcohol at their weddings (for a variety of reasons), but for couples who are planning on imbibing on their big day, here are some interesting ideas for your bar needs on your special day. 1) Water Cooler Bar. Instead of paying for a bartender, take DIY to the next level with this fantastic idea! Get water coolers and old jugs, then put your alcohol and mixers in the jugs, set up a station with ice and cups, and then let guests have at it. Guests will have fun crafting their own cocktails in this unconventional way. 2) Ice cubes made of mixers. This can also be a good idea for non-alcoholic drinks because it will prevent them from getting watered down. Get even more creative by freezing them in uniquely shaped silicone ice cube trays. 3) Have fun and eccentric ways to serve alcohol. There are plenty of cool ways to serve alcohol. Try taking a watermelon and putting vodka in it, then cutting it into slices (or use whatever liquor you like, Malibu can be really tasty!). 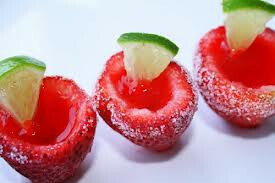 4) Another idea is to make jello shots in fruit slices. This works best with citrus, although some brave souls have done it with strawberries (the bigger, the better). For example, take an orange, cut it in half, scoop the guts out, and then fill it with orange jello shot mix (just replace the cold water with the booze you want to use). Once the jello is solidified, cut the halves into slices and serve. Another idea? Use limes with tequila, then offer some rock salt to guests for a modified tequila shot! 5) Infused liquors. These are fun because they can come in so many different varieties. Infusing with fruit is the most conventional way, but if you want to try something out of the box, take vodka and infuse it with skittles (take five smaller bottles and put the different colors in each; DO NOT put them in the same bottle!). It will be rainbow colored and make for some delicious cocktails.